Timing is everything and when it comes to weight training and muscle building, everything has to be timed perfectly to get the best results. The dynamics of food and fluid consumption in relation to sports and exercise performance is important to plan when you're looking to build strength and muscle. Here are our tips for when, what, and how much to eat around your training sessions. These factors need to be adjusted for energy intake and expenditure according to any particular session, sessions over 24 hours and extended training periods. How you should eat to maximize an average weight training session is necessarily different from eating to maximize a lengthy endurance training run, swim or team sports session that may involve more or less continuous exercise for two hours or more. Such activity involves a much higher energy expenditure and a food intake to match. Since we're focused on weight training and bodybuilding, we'll share an overview of meal timing specific to building muscle. This meal is essential as it isn't good to exercise hard on an empty stomach. What you need to watch is your calorie intake and activity expenditure over 24 hours. Let's assume an average session is approximately 75 to 90 minutes, including 20 to 30 minutes of cardio. The remainder is a series of weights sets and repetitions at various intensities and perhaps some circuit activities. This would be a very solid session and some will do less than this on average. Ideally, a main meal should be taken 3 to 4 hours prior to your training session, and you should have a small snack at 45 to 75 minutes before the training session, depending on how you tolerate food in the stomach when exercising. As you get closer to exercise, fluids, such as sports drinks, coconut water, and simple carbohydrates, will sit better and digest faster. Training early in the morning can obviously make this timetable problematic, and you may need to take more sustenance during exercise if you have early morning training session. Protein. Your pre-exercise meal should include protein and carbohydrate. Recent research suggests that a small quantity of protein taken after a weight training session helps with protein assimilation and muscle rebuilding in the recovery phase. Less established is a requirement for protein before exercise, although some research suggests a small amount may also assist overall recovery. You don't need much protein to stimulate this effect: 10 to 20 grams is all that's required. A glass of skim milk has about 10 grams of protein. You really don't need expensive protein powders either, although they won't hurt. Carbohydrate. The amount of carbohydrate you should eat before training depends on the duration and intensity of the exercise session or event and time since the most recent full meal. Naturally, unlike a marathon runner, you don't need to load up on carbs before a weight training session. Some carbohydrate, though, in the form of a shake or a few pieces of toast or cereal should be enough to keep blood glucose from dropping too low during the session. In both cases—protein and carbs—choose something that you know your system will tolerate well. This can be a matter of trial and error. High-fiber foods, such as fruit, beans, and high-bran cereal may not be ideal for some people. Some individuals have a fructose sensitivity, so fruit or sugars may not suit them. Fluids. Drink sufficient fluids so that your urine color is a light lemon and not a dark yellow. This will tell you that you are well hydrated. You don't need your urine color to be completely clear. Fluids and fuel. If you plan on training for longer than an hour at a reasonably high intensity, you should take about 400 milliliters (14 fluid ounces) of a sports drink (about 7% carbohydrate and 25 grams of carbohydrate) every 30 minutes. If it's very hot and you sweat profusely, you may need a little more fluid, but not too much more. This will keep blood glucose topped up nicely, and you won't drain your muscle glycogen stores as quickly—enabling you to perform better—and you won't get into a catabolic, high-cortisol state, where muscle and immunity could suffer. Here's the best approach to refueling and rehydrating after your weights session based on current evidence in sports medicine. Fluids. In the first hour or so, try to drink enough fluids to recover what you have lost plus 50% on top of that to compensate for the post-exercise energy expenditure, especially if you plan to train again that day. You can measure fluids lost by body weighing before and after. 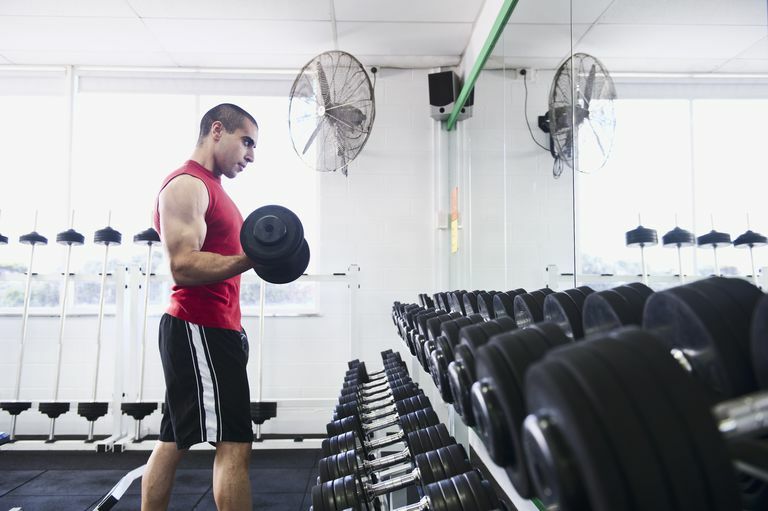 Weight training is not that critical an activity for fluid loss, so just be sure you stay hydrated without drinking too much, which can also be dangerous. Protein. Consume 10 to 20 grams of protein with carbohydrate within 30 minutes of your session. Aim for a maximum of .8 to 1.0 grams per pound of body weight per day in total protein consumption. Less may be appropriate for lighter training programs. Remember that food is fuel for your body and fine-tune these recommendations to fit your needs and training. If you feel that your meal plan is too much or not enough, don't be afraid to finagle things to get it just right. Gleeson M. Can nutrition limit exercise-induced immunodepression? Nutr Rev. 2006 Mar;64(3):119-31. Review. Koopman R, Saris WH, Wagenmakers AJ, van Loon LJ. Nutritional interventions to promote post-exercise muscle protein synthesis. Sports Med. 2007;37(10):895-906. Review. Tipton KD, Wolfe RR. Protein and amino acids for athletes. J Sports Sci. 2004 Jan;22(1):65-79. Review.